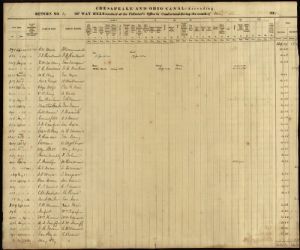 This is a listing of WAY BILLS received at the Collector’s Office in Cumberland during the month of May 1858. Most of the boats returned from Georgetown empty (Georgetown was Mile 1 and Cumberland Mile 185) so they paid the standard toll of $4.08. J. L. CATHCART transported a carriage and 50 tons of salt to Cumberland and castings for 55 miles. He also carried two loads of plaster. His toll was $55. W. G. MORRISON had a cargo of one ton of plaster for 57 miles and paid 14 cents additional in toll. Flour, meal, grain, seeds, &c.
Wrought Iron, Nails, and other Hard-ware. Dry goods, groceries and other merchandise. Mill Offal, Potatoes Turnips &c.
Lumber, Laths, Palings, Shingles, Hoop-poles. Rails, Posts, round and square Timber. Ashes, lime, and other manures.